Mysteries and Manhattan: two of my favorites! Join seventeen award-winning mystery writers as they each “visit" a neighborhood in Manhattan and bring you a delightful short mystery set there. Mary Higgins Clark goes to Union Square, Ben H. Winters wanders over to Chelsea, and Angela Zeeman tackles Wall Street. Humorous, noir, and in between – anyone who enjoys mysteries will enjoy keeping this book by the bedside and puzzling over a new mystery in Manhattan every night! From Wall Street to Harlem, the borough of Manhattan is the setting for all-new stories of mystery, murder, and suspense, presented by best-selling author Mary Higgins Clark and featuring an exclusive Jack Reacher story by Lee Child, as well as other takes from top Mystery Writers of America authors. In Lee Child's “The Picture of the Lonely Diner,” legendary drifter Jack Reacher interrupts a curious stand-off in the shadow of the Flatiron Building. In Jeffery Deaver’s “The Baker of Bleecker Street,” an Italian immigrant becomes ensnared in WWII espionage. And in “The Five-Dollar Dress,” Mary Higgins Clark unearths the contents of a mysterious hope chest found in an apartment on Union Square. 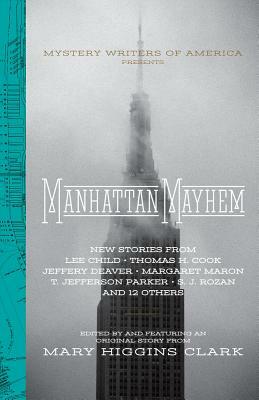 With additional stories from T. Jefferson Parker, S. J. Rozan, Nancy Pickard, Ben H. Winters, Brendan DuBois, Persia Walker, Jon L. Breen, N. J. Ayres, Angela Zeman, Thomas H. Cook, Judith Kelman, Margaret Maron, Justin Scott, and Julie Hyzy, Manhattan Mayhem is teeming with red herrings, likely suspects, and thoroughly satisfying mysteries. Mary Higgins Clark, #1 international and New York Times best-selling author, has written thirty-four suspense novels. Her books have sold more than 100 million copies in the United States alone. Mystery Writers of America is the premier organization for mystery writers, professionals allied to the crime writing field, aspiring crime writers, and those who are devoted to the genre.